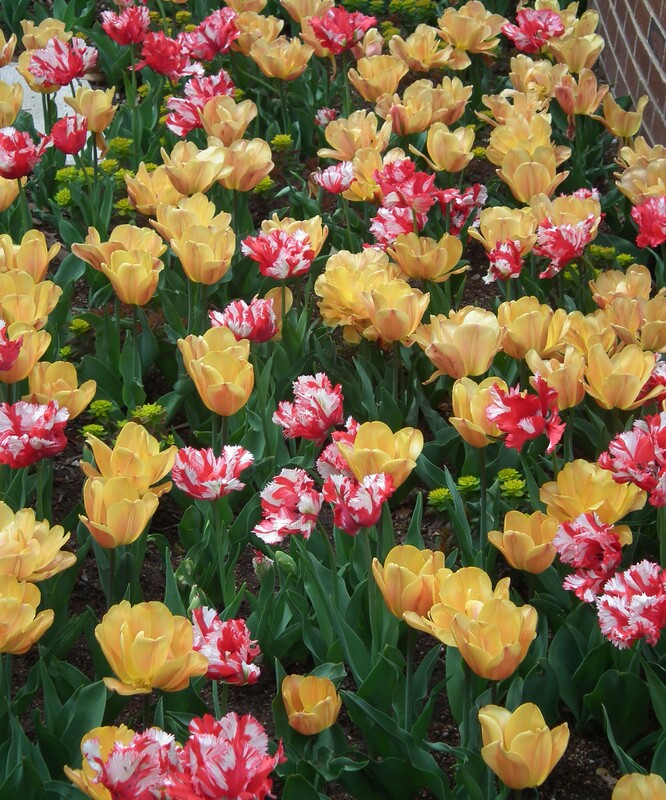 Tulip time at the Missouri Botanical Gardens has already come and gone but maybe this posting can help you with some ideas for your garden next spring. 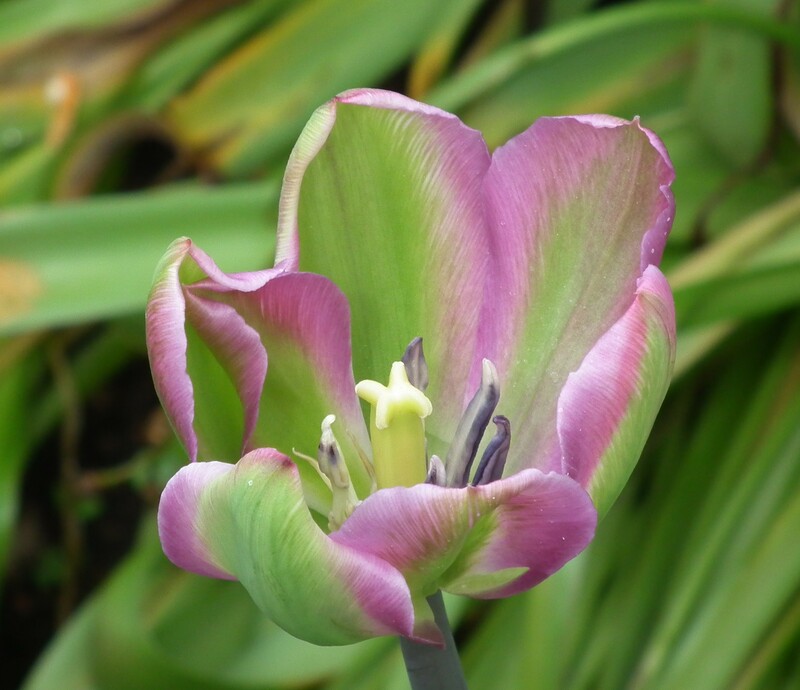 I hope you enjoy my Mo Bot tulip photos and then go see the surprise that lives in the Climatron…….. SURPRISE! 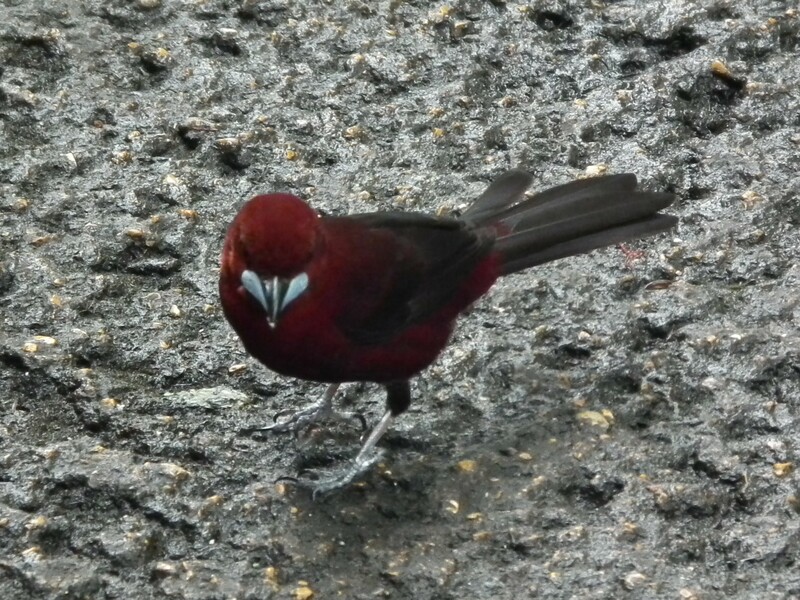 from one of the geckos that resides in the Climatron …..and also …..
this Silver Beaked Tanager ( who also lives in the Climatron) is very friendly if you bring him bird seed . 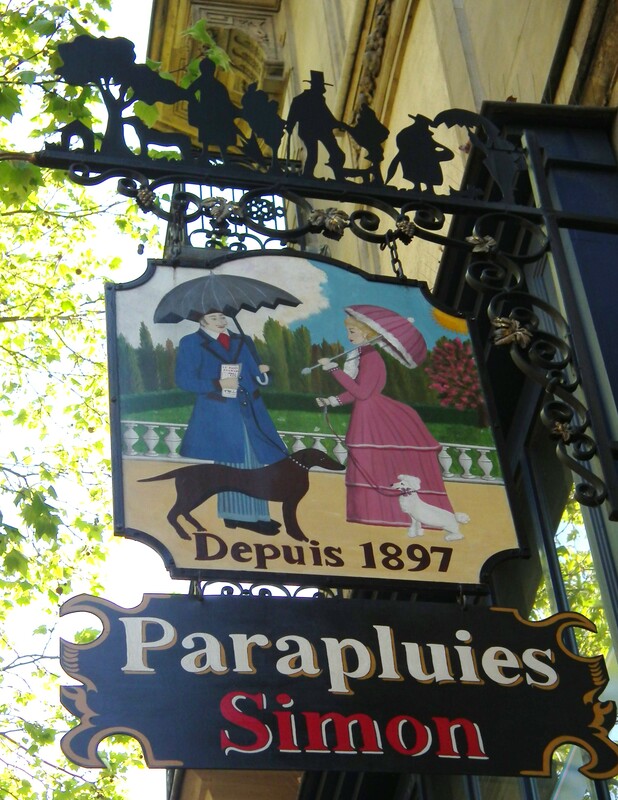 Dedicated to all of you happy travelers who delight in the same addiction as I do…here are my final photos of my April 2014 trip to Paris, France. Such a beautiful city with so much to enjoy. 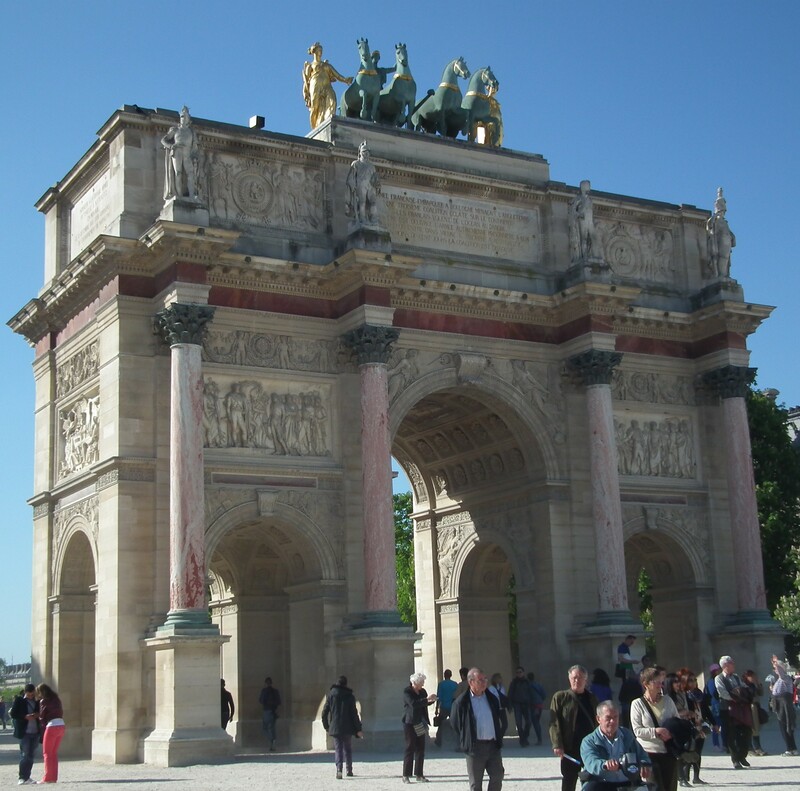 Arc de Triomphe du Carrousel – built in 1806 to commemorate Napoleon’s military victories. 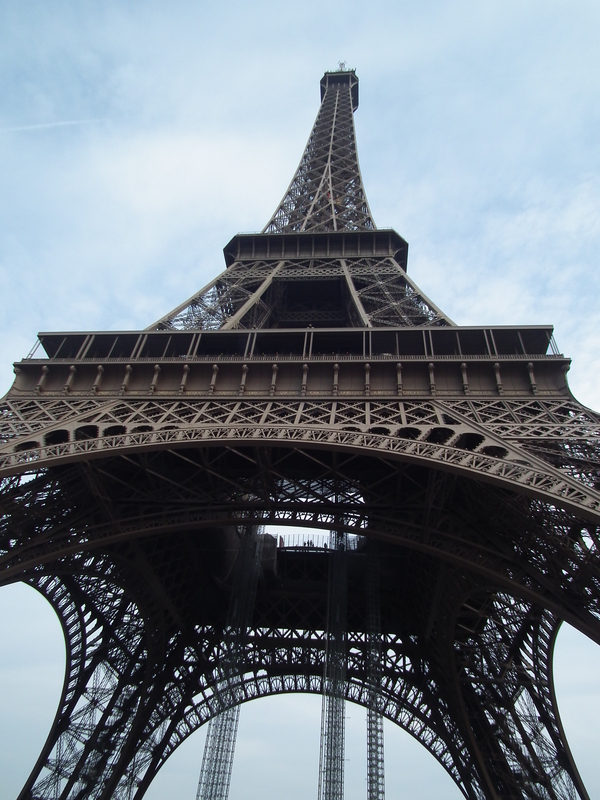 It stands on the sight of the former Tuileries Palace ( yet another palace for the kings). 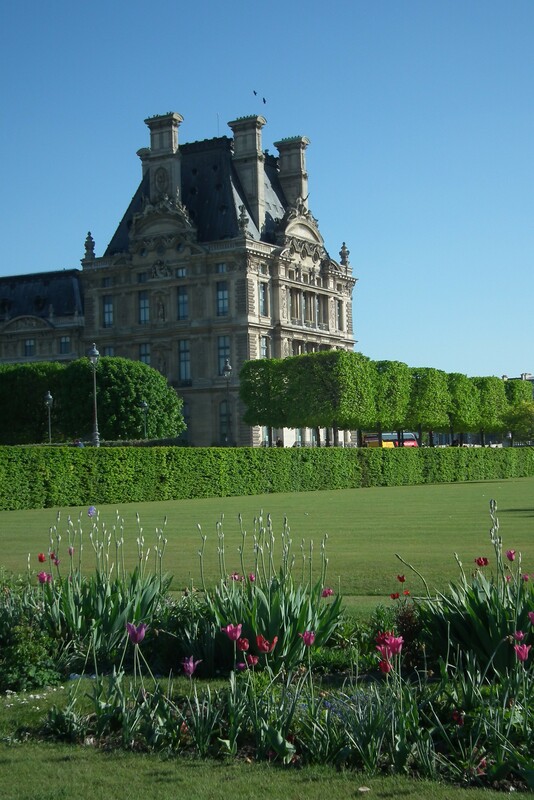 Tuileries Garden: Queen Catherine de Medicis created the garden of the Tuileries Palace in 1564, it was opened to the public in 1667, and became a public park after the French Revolution. 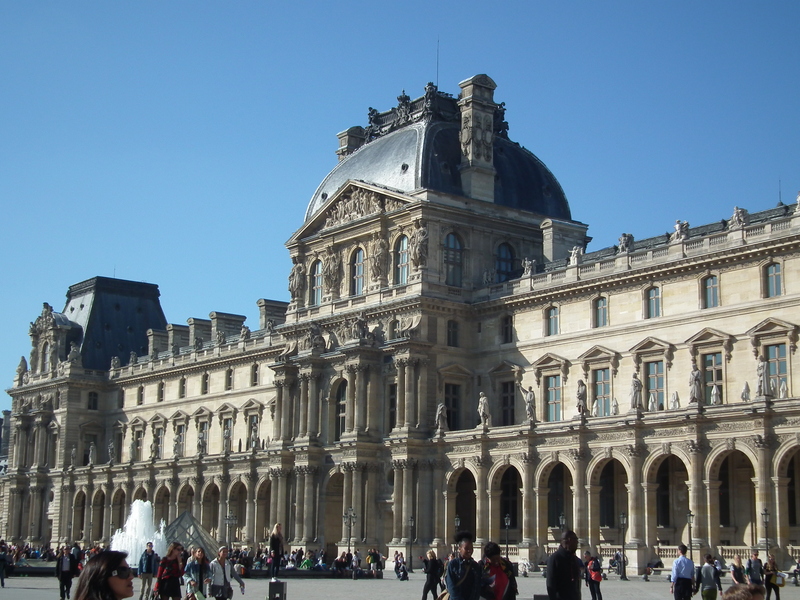 The Louvre ( a small portion of) – also a former palace of the kings and now an art museum where the Mona Lisa resides. 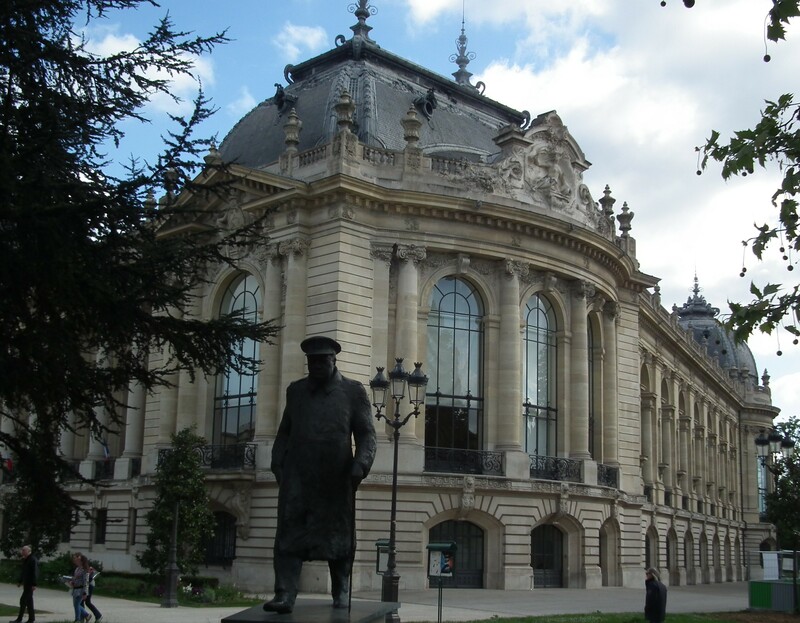 Winston Churchill sighting at the Grand Palais : The Grand Palais was built for the 1900 World’s Fair in Paris as an exhibition hall. During WWI it was used as an military hospital , than during the France Occupation by the Nazis, they used it as a truck depot and later to house propaganda exhibitions. 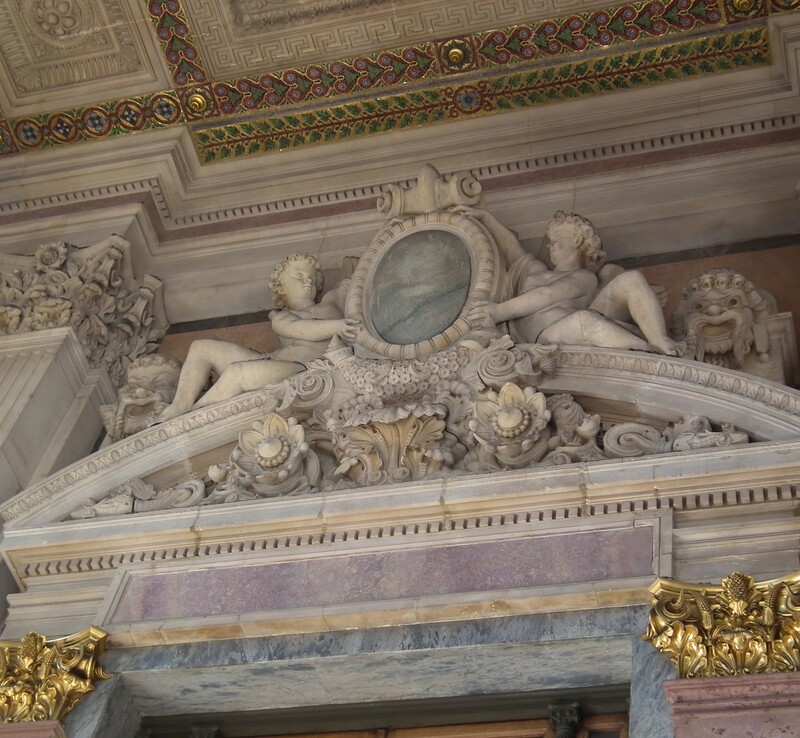 Again, this building is huge, has three separate entrances and this photo only captures a small section of it. Les Invalides – Built in 1670 as a military hospital and home for war veterans, Les Invalides is a now a complex of buildings with museums, monuments and burial vaults all relating to France’s military history. 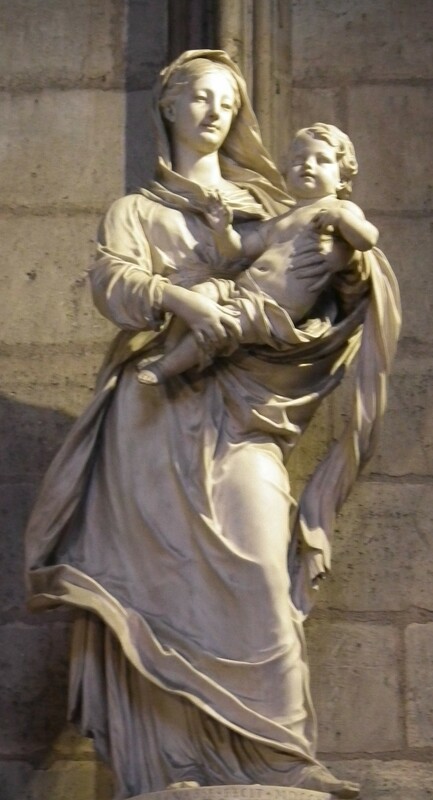 Statue inside Notre Dame Cathedral. 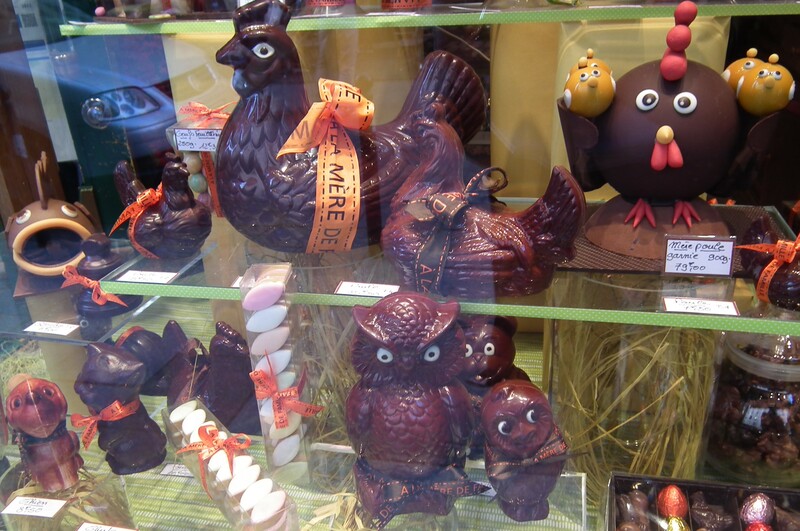 Bird Watching in Paris – window shopping in Paris can make you hungry! 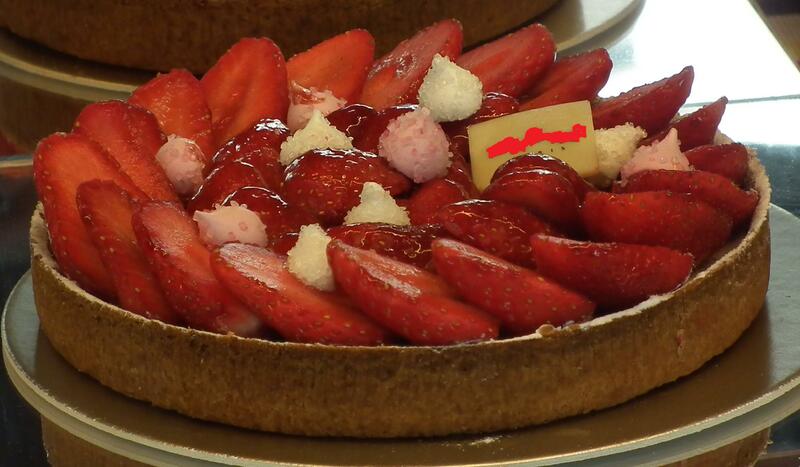 WONDERFUL PATISSERIES ARE ALSO EASY TO FIND. 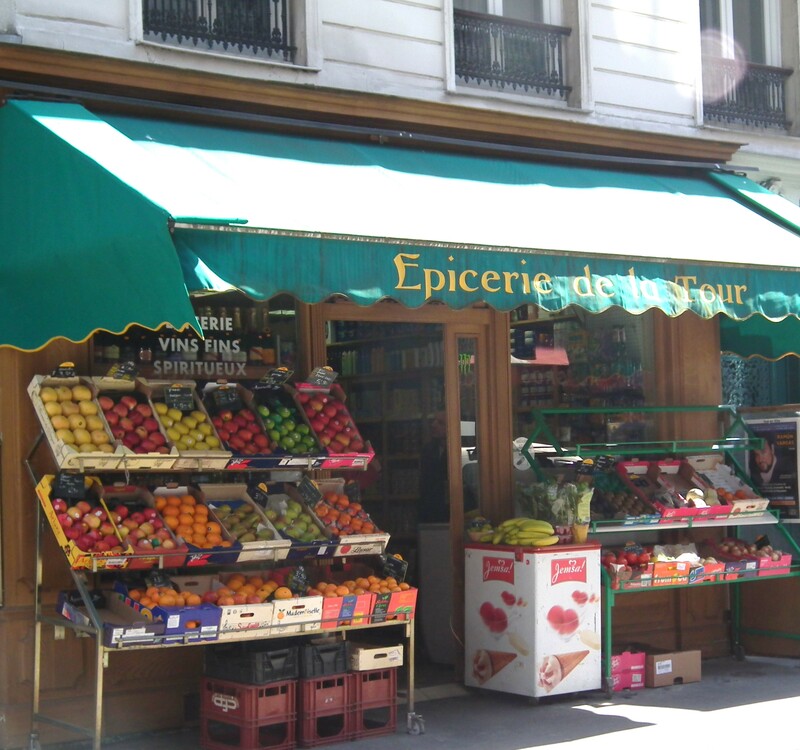 Lastly, neighborhood fruit stands are so Paris! Love them!! 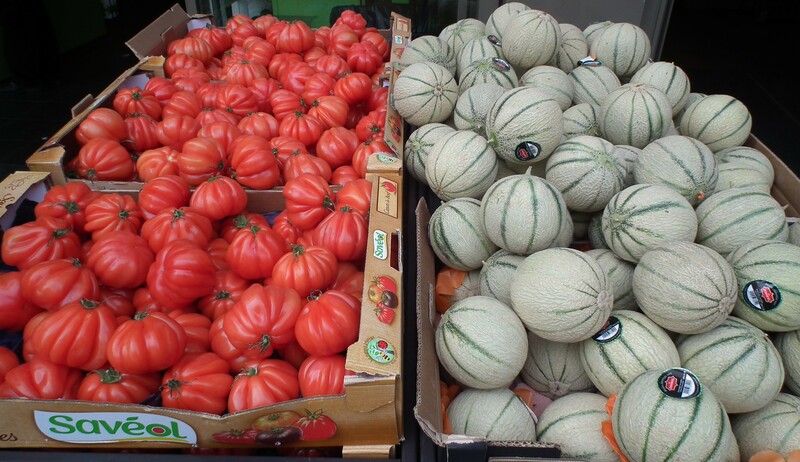 Jusqu’à ce que je retourne……. 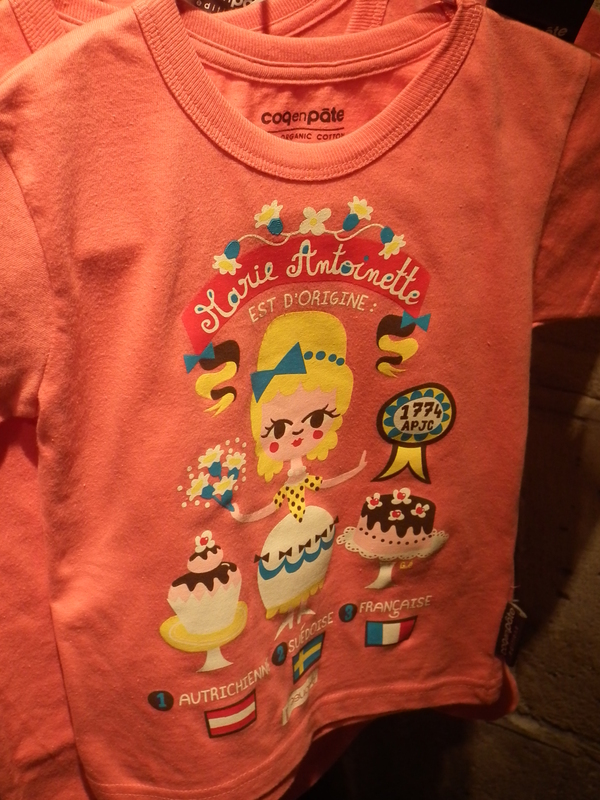 Marie Antoinette was beheaded via the guillotine on October 16, 1793, approximately 8 months after her the execution of her husband, the former King Louis XVI of France. 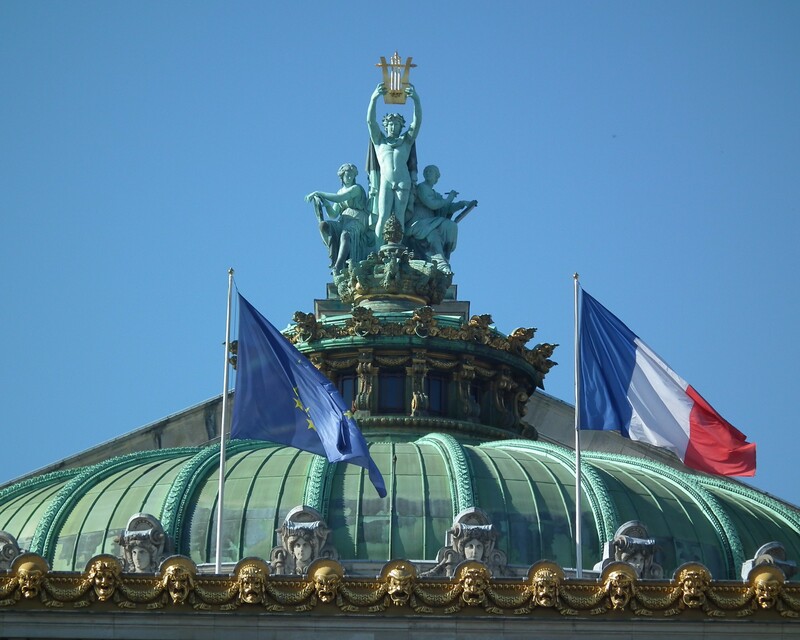 The reasons behind the French Revolution and how the King and Queen lived shamelessly extravagant makes for very interesting reading. Simply put, in the end, revolutionary forces captured Louis and Marie-Antoinette during their attempt to flee the country, monarchy was abolished, and Louis and Marie-Antoinette were condemned for treason. 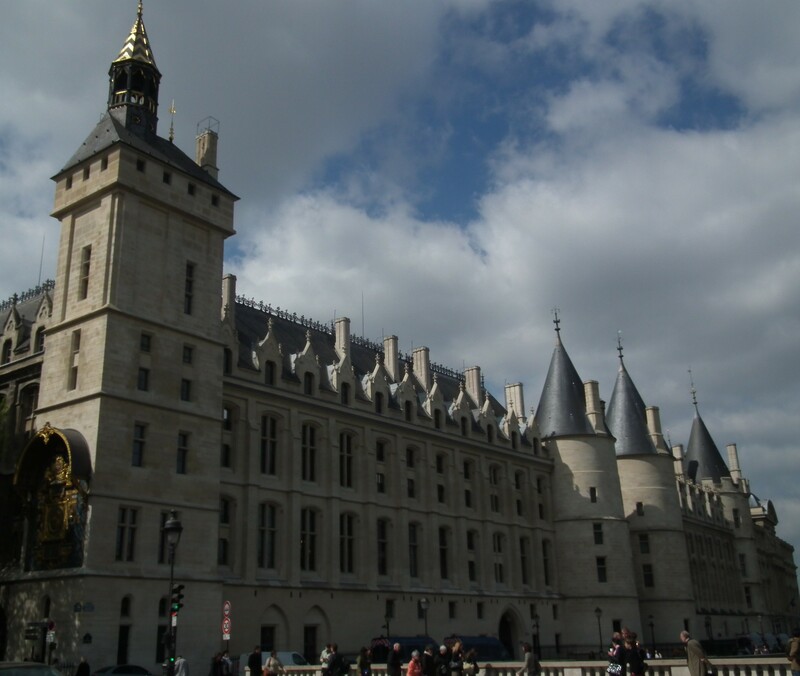 The Conciergerie is where Marie-Antoinette was imprisoned during the final days of her life. 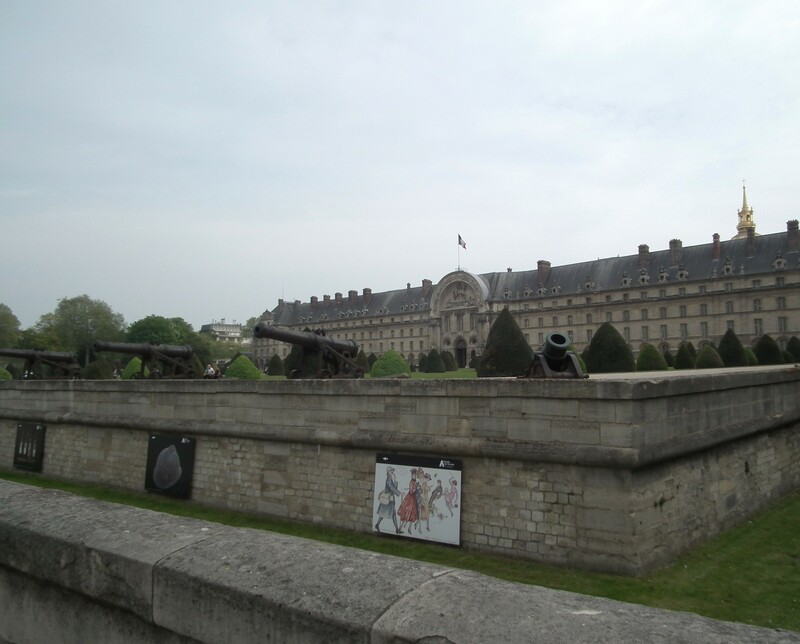 The building was originally a royal palace but in 1391 it became the Parliament of Paris and a portion of it used as a prison. 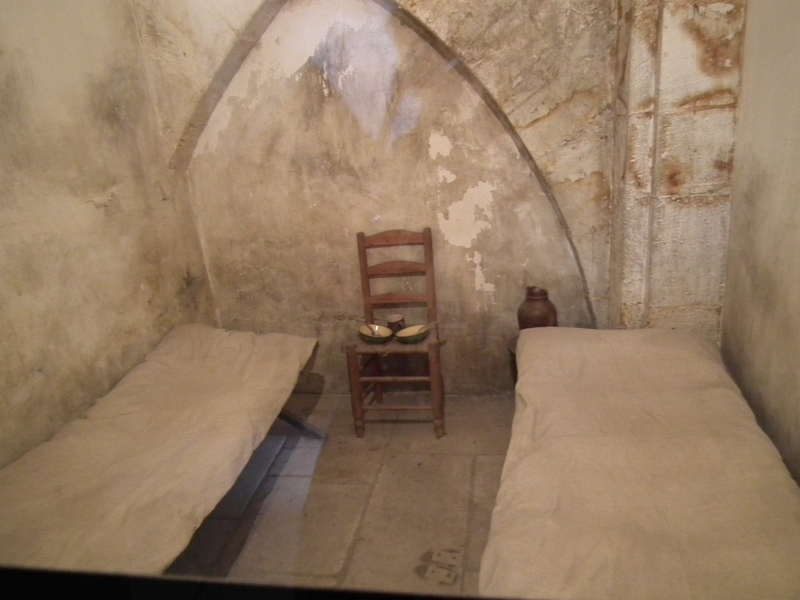 If you were imprisoned and had no money, your accommodations consisted of concrete walls, straw on the floor and a bucket. If you had money to pay, you could possibly have a little nicer stay. 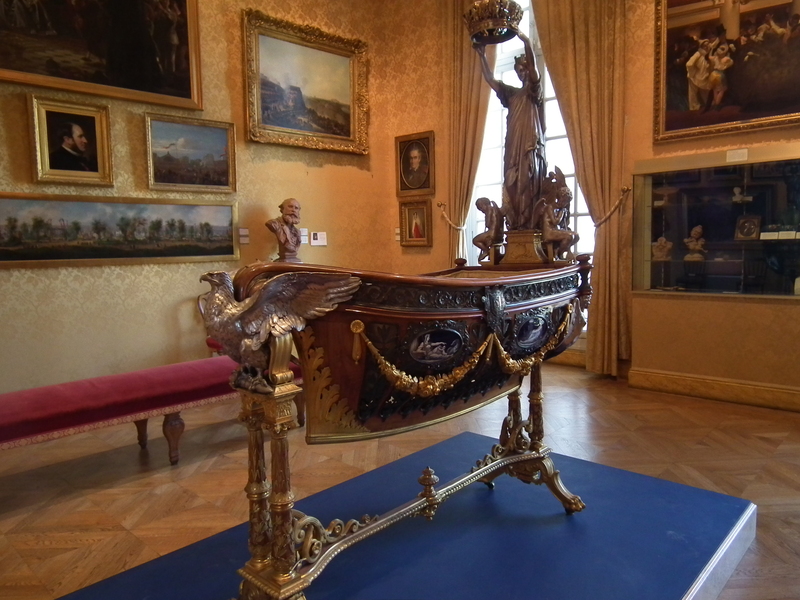 This was a re-creation of the cell Marie-Antoinette was kept in. She is dressed in black since she was mourning the death of her husband. She was also had two guards with her at all times. 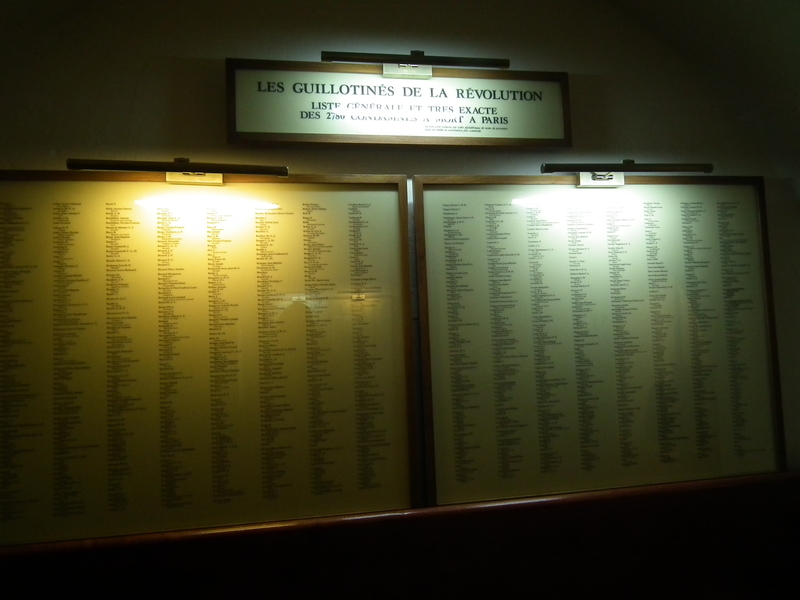 Lists of the 2780 people who were executed by the guillotine . 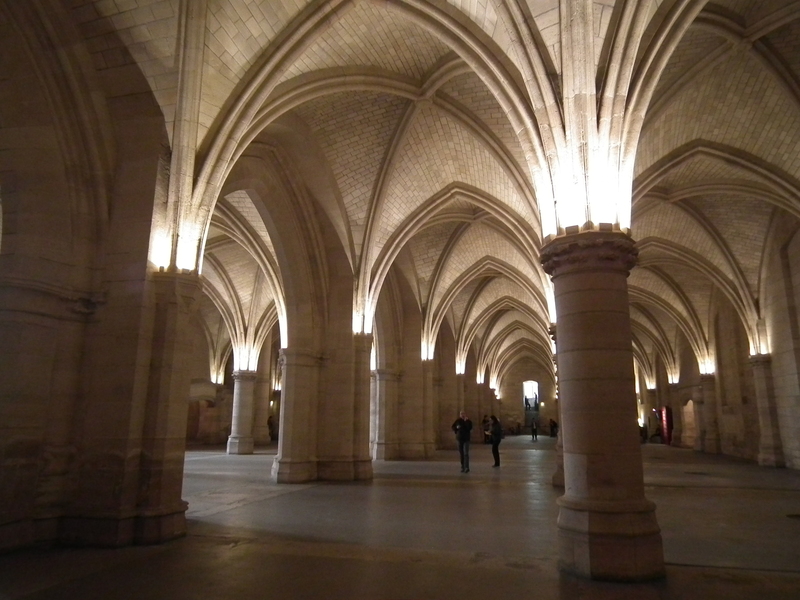 The Hall of Men-at-Arms proves the building is not all doom and gloom. The architecture inside is beautiful with the way the light bounces around. 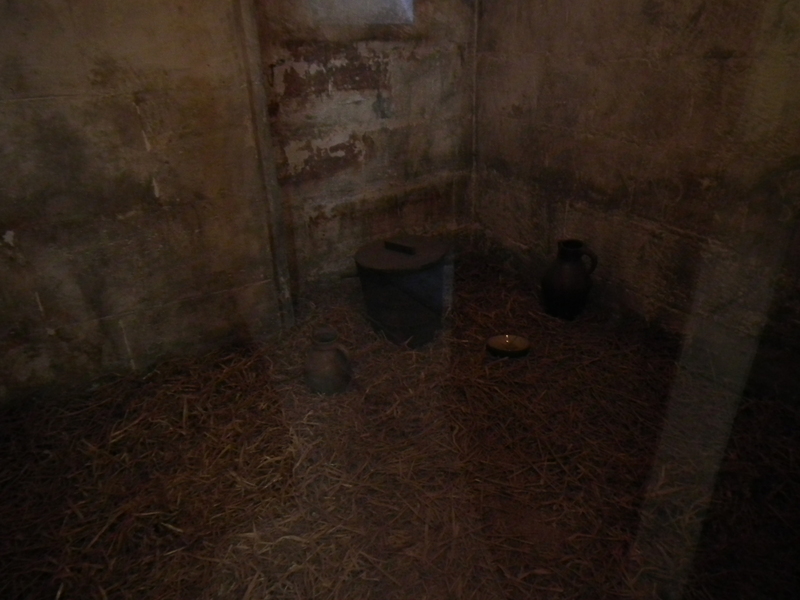 This room used to be the dining room for the guards. 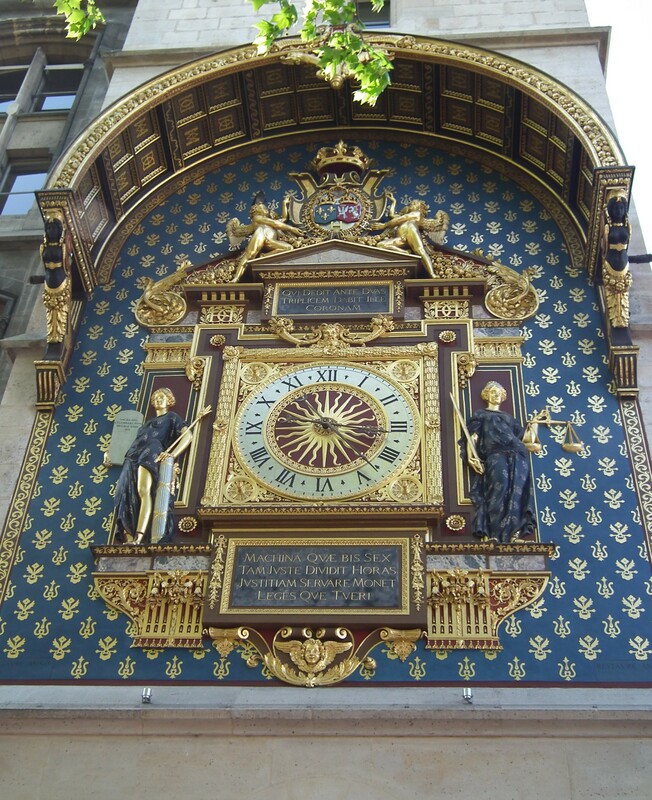 Lastly, this beautiful clock hangs on the outside of the Conciergerie. 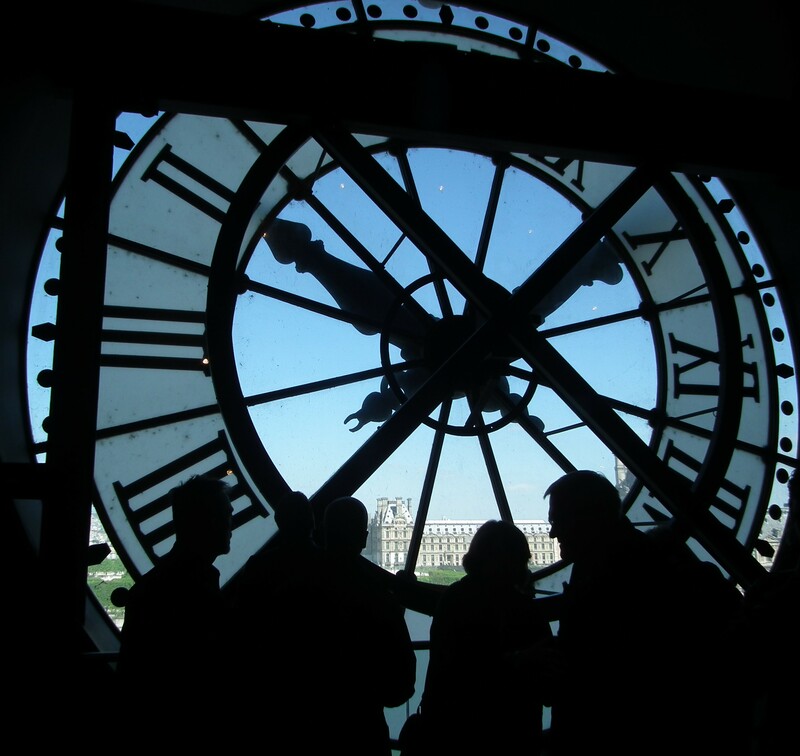 It is the oldest clock in Paris dating back to 1535. Granted, it has been restored more than once, but it still works. Just for grins, check the time against your smart phone………. 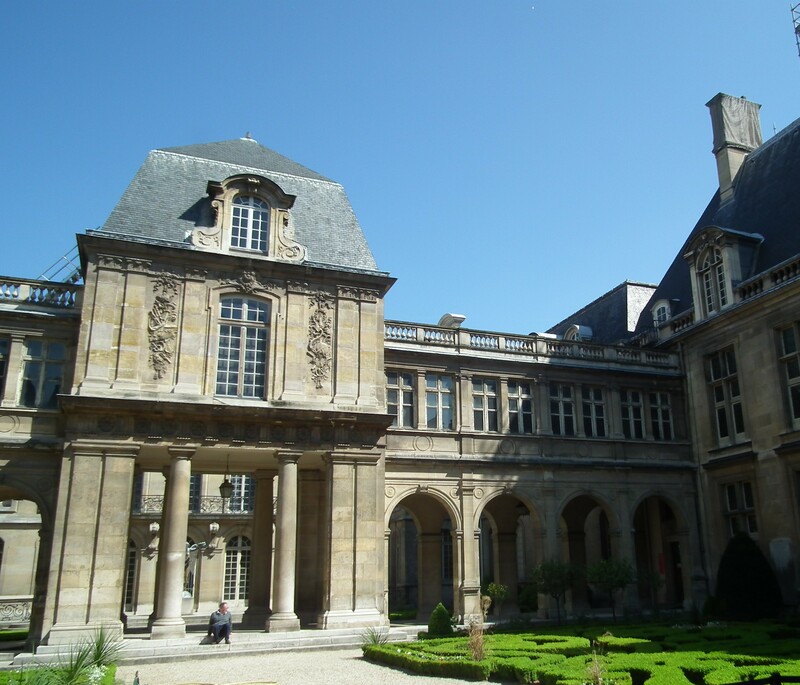 In the Marais District of Paris is the Carnavalet Museum which is dedicated to the history of Paris. It is housed in two neighboring mansions that were built in the 16th and 17th century. It has over 600,000 pieces and 100 rooms. 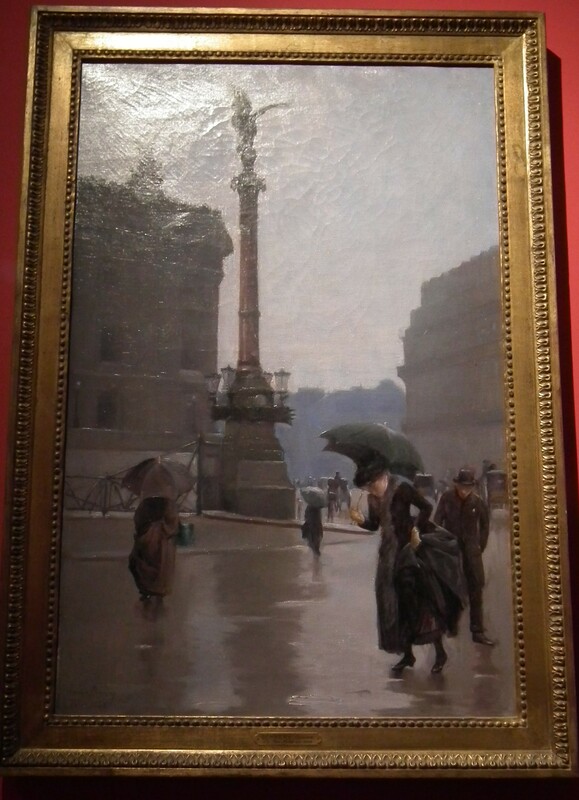 I enjoyed wandering through this museum and especially seeing all of the paintings of Paris from the “day’s gone by” era. 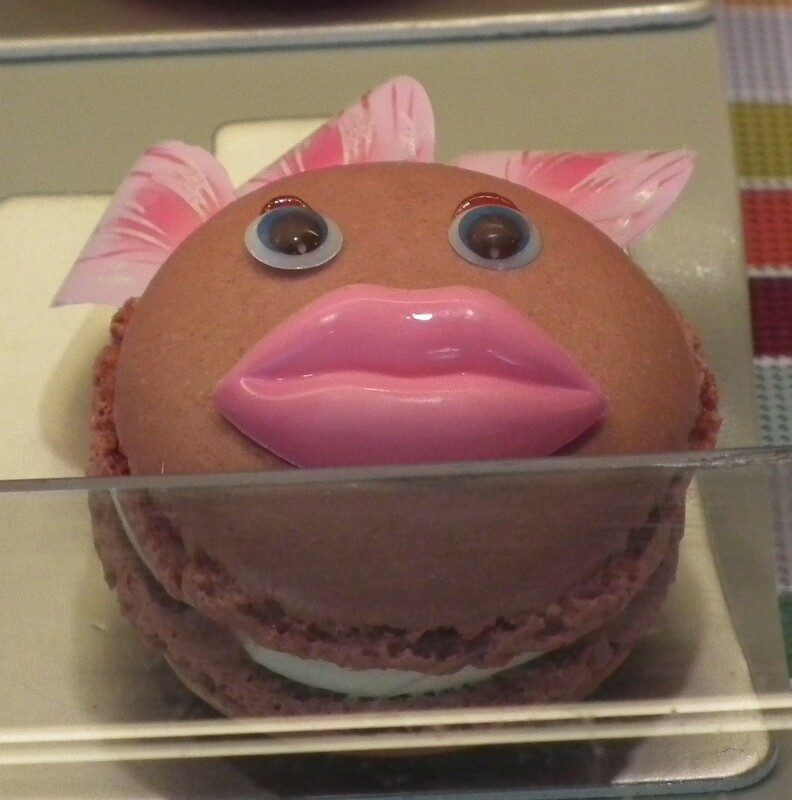 Admission is free but everything is in French. 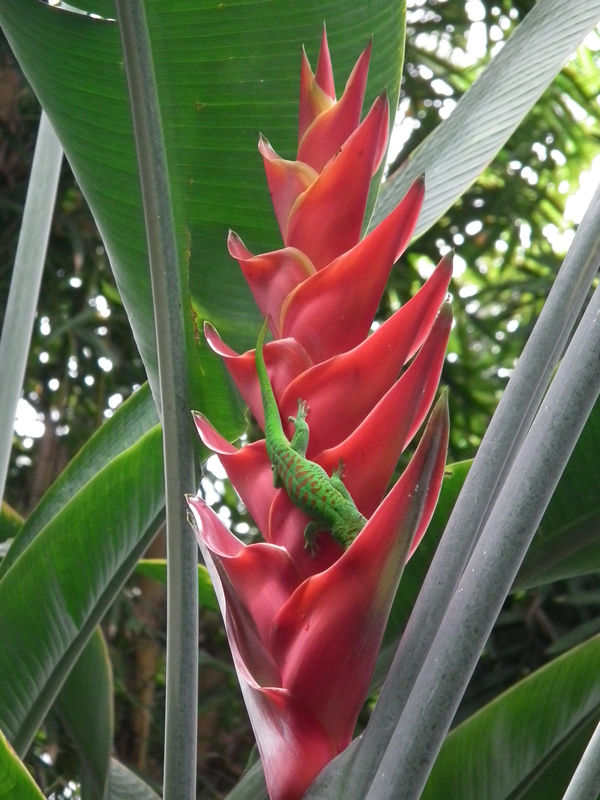 So, unless you know the language, it is truly a museum of looking and not necessarily knowing what you are seeing. Had I had more foresight, possibly I would have read about the contents before going. None the less, I enjoyed walking about for a couple of hours exploring the different rooms and simply absorbing the adventure of being totally language-disconnected. 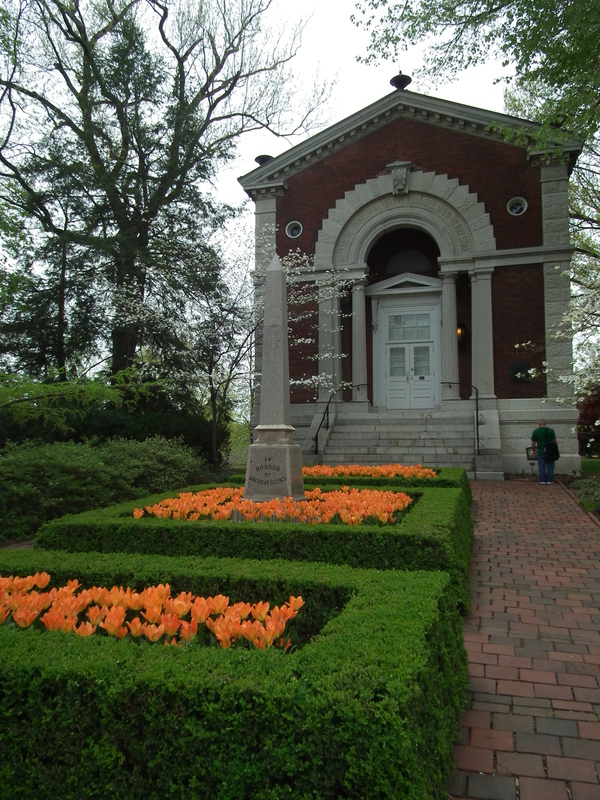 One of the mansions that houses the museum. 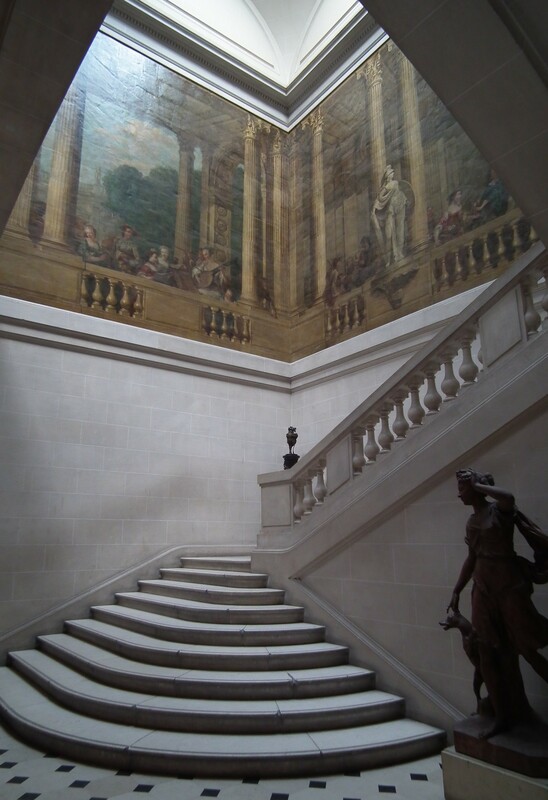 One of the entrance hallways. Painting by Gustave Denney that I liked. 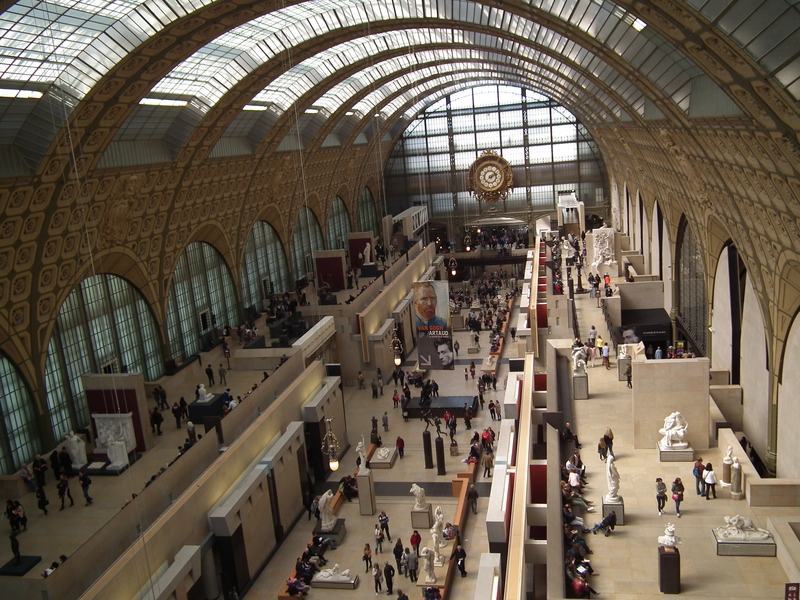 The Musee d’Orsay is without a doubt one of my favorite museums. It was well worth the hour and a half that I stood in line to get in. ( That was with the Museum Pass.) 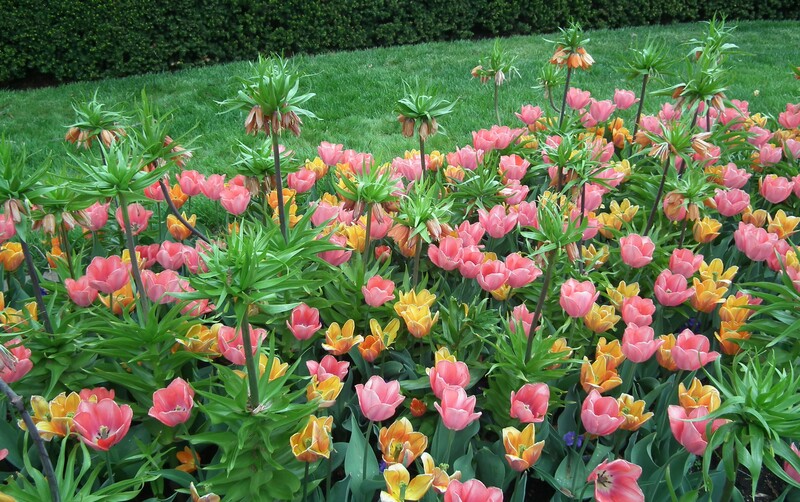 Known for Europe’s greatest collection of Impressionist pieces, it will not disappoint. The building used to be an old train station built in 1898 and has been transformed with the style you would expect in the city of Paris. 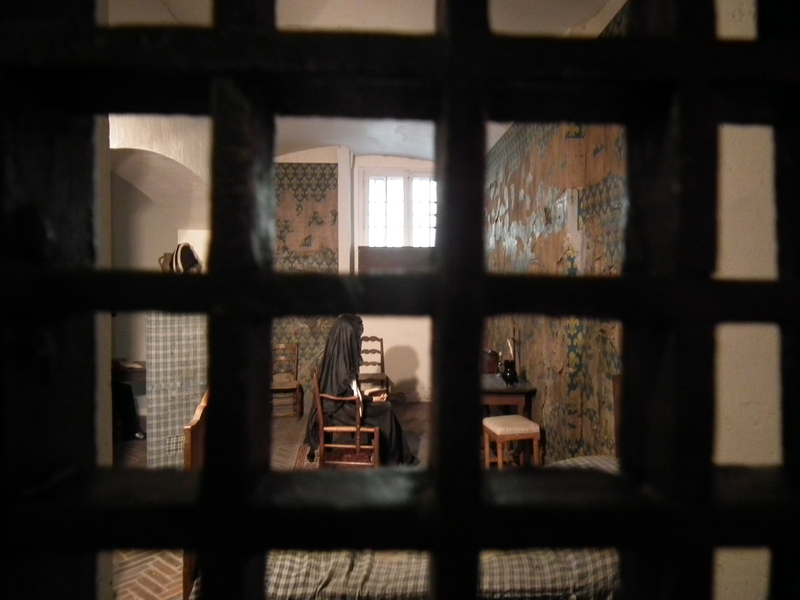 Be sure to stop in and say Hello to Whistler’s Mother…. 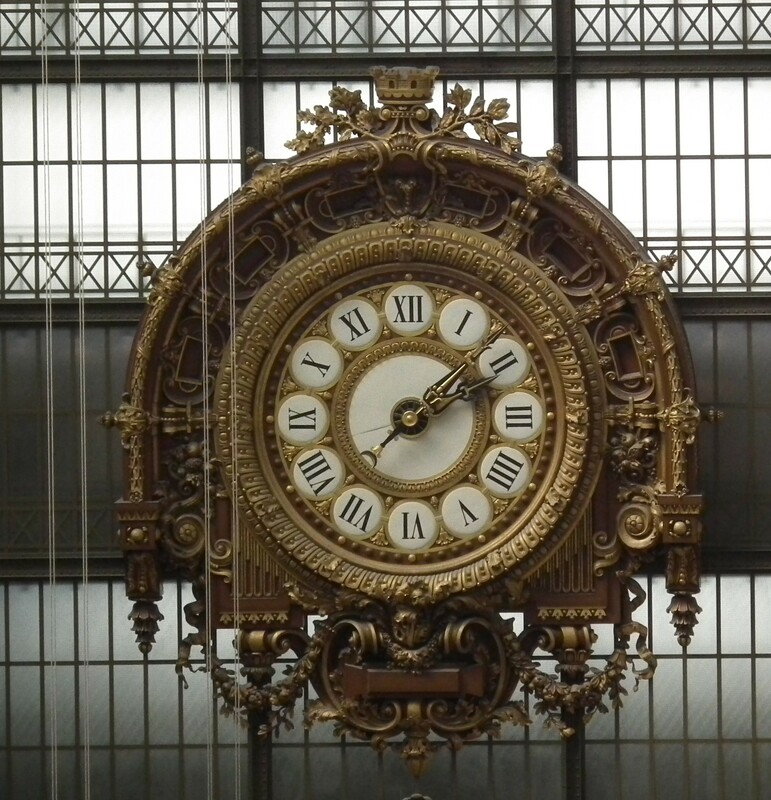 The original train station clock over looks the Great Hall…. 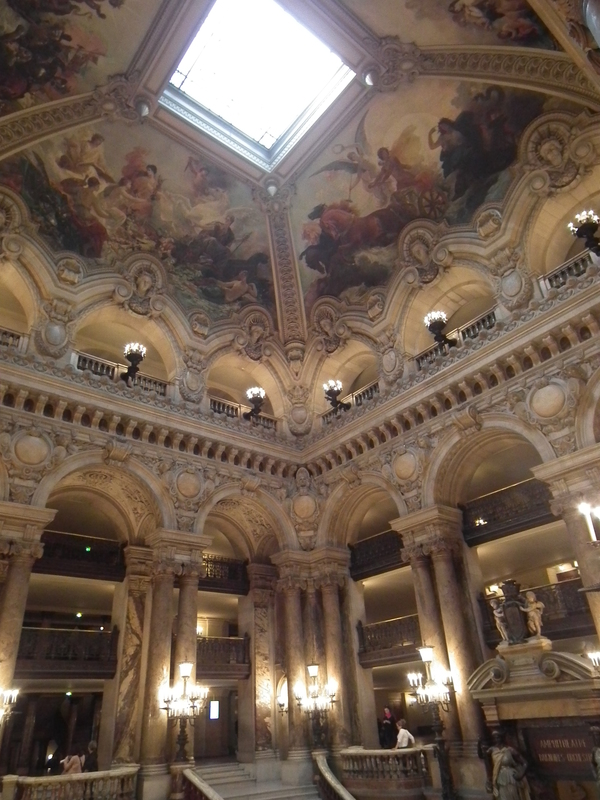 The Great Hall of the Orsay. Looking from the inside out to the roof and beyond for views of the city. 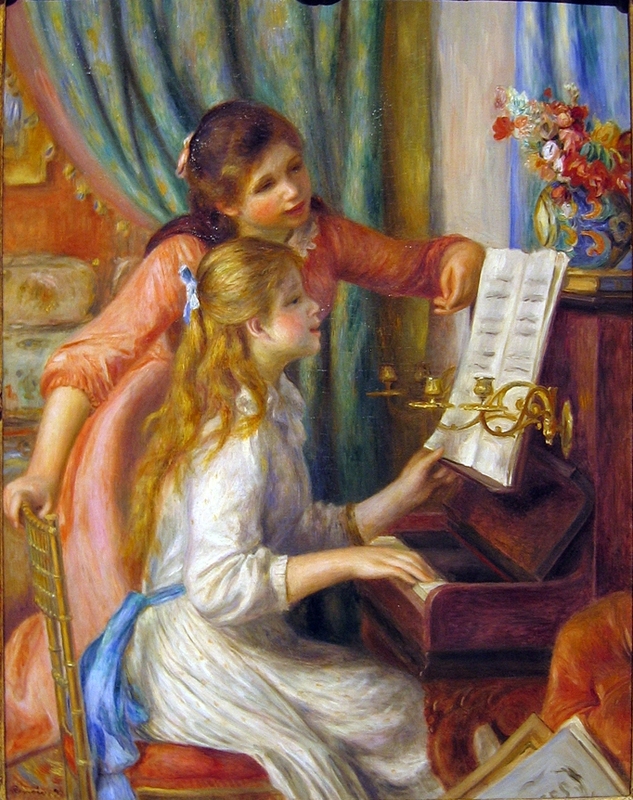 Young Girls at the Piano – just a sampling from my favorite artist, Renoir, who has 81 paintings at the Orsay. 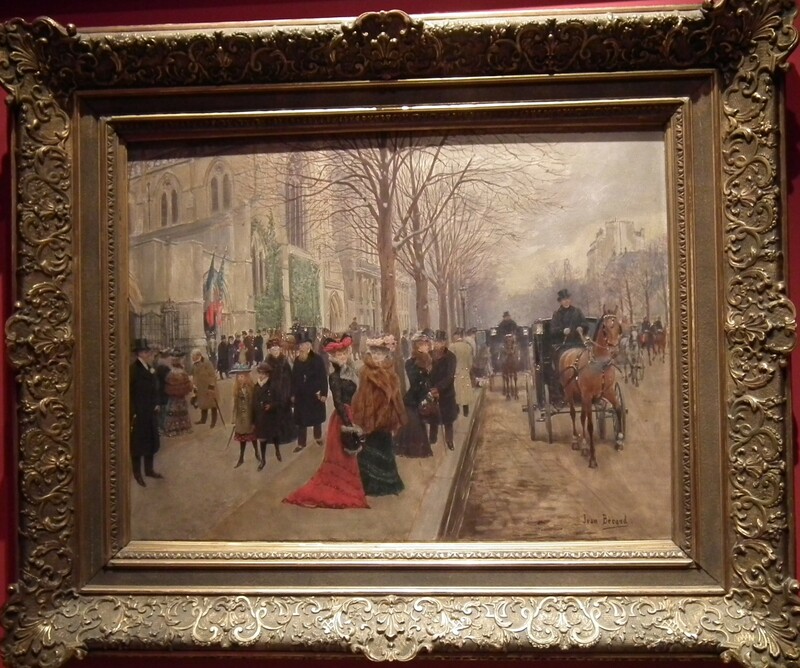 The Impressionist paintings are on the top floor – see these first. Also, be sure to take a quick glance outside the clock tower before you leave. 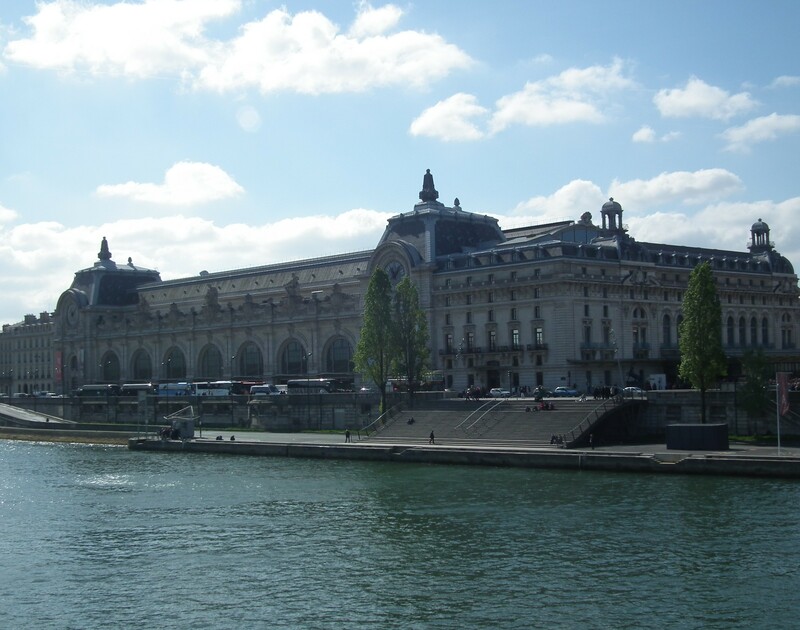 Then stop at the gift shop and buy the post cards or book marks of your favorite paintings since you cannot take photos in the Orsay. 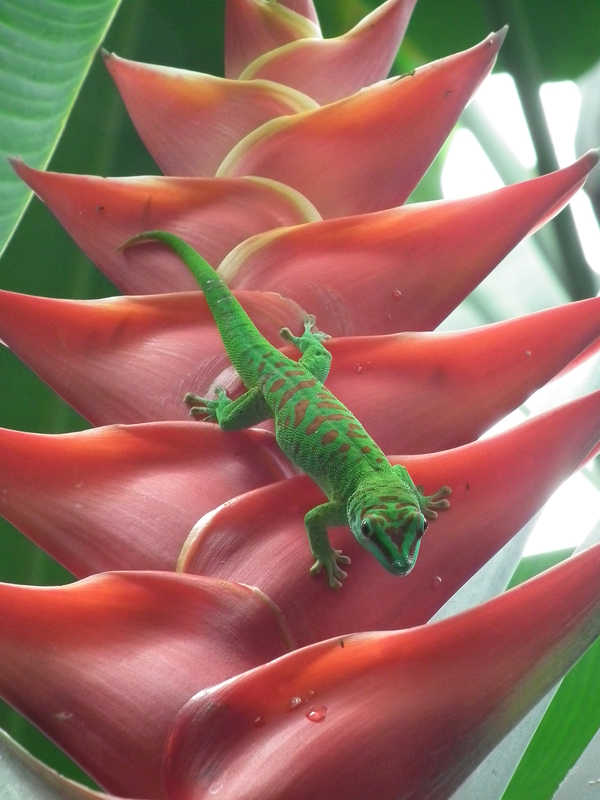 Or buy the book – its a great way to take home this fascinating building of art. 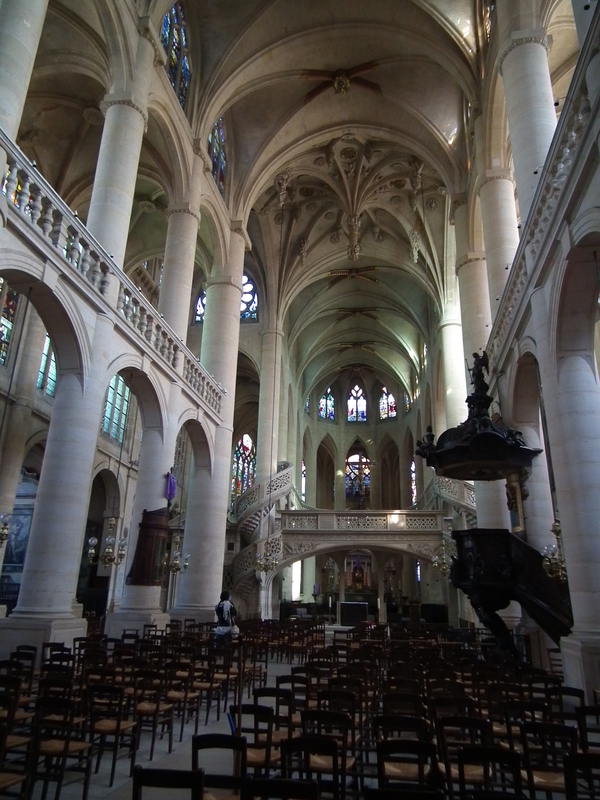 As I’m looking back through the photos from my April in Paris trip, I realized I needed to post about this beautiful church that, literally, sits in the shadows of the Pantheon. 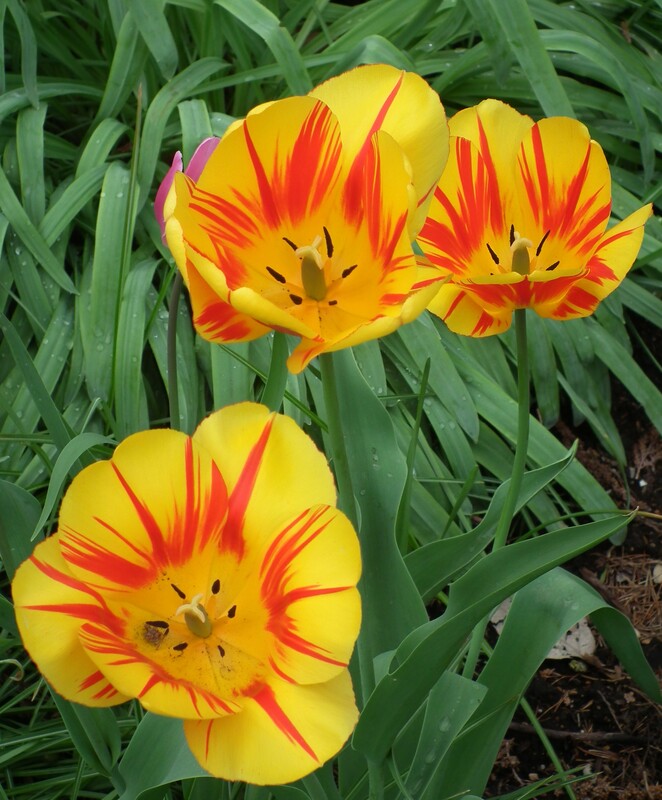 It could easily be overlooked, but it’s well worth taking the time to look inside. 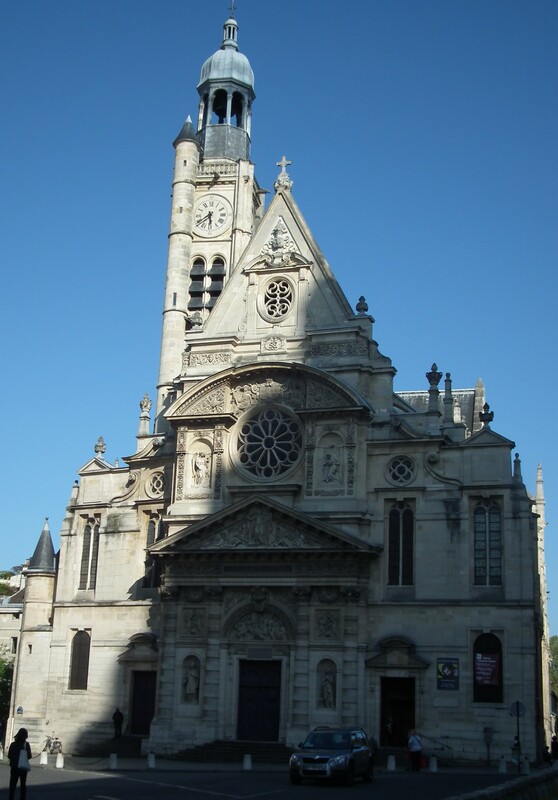 The building of St. Etienne-du-Mont began in 1492 and was finished in 1626. 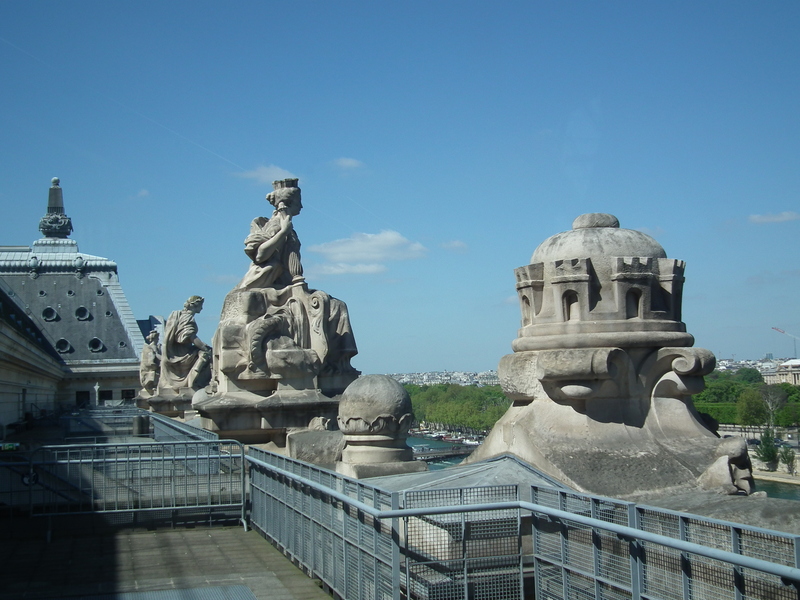 It contains the shrine of St. Geneviève, the patron saint of Paris. 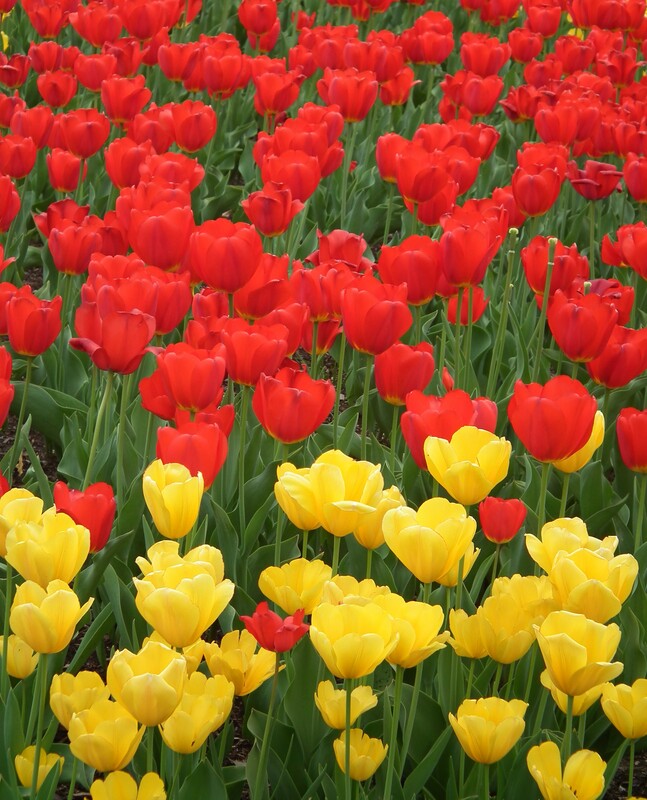 Walking inside will catch you by surprise… ( well, maybe not – now that I have told you). With the streets of Paris a few steps outside so busy, St. Etienne is almost empty, so quiet and peaceful. 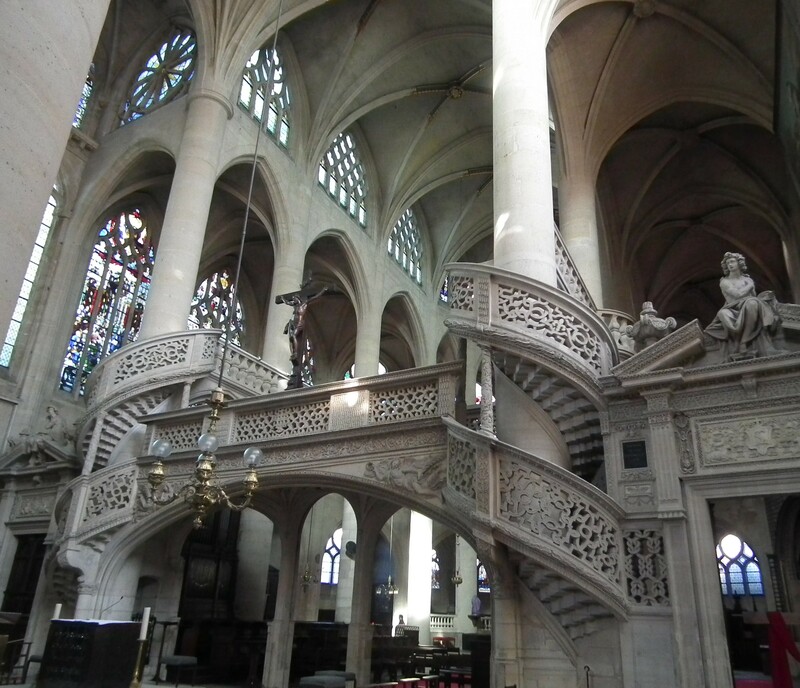 This Rood Screen, the double -stair arch that separates the choir from the rest of the church is beautifully carved and unusual, as it is the only rood screen left in Paris . The wooden pulpit dates from 1651. 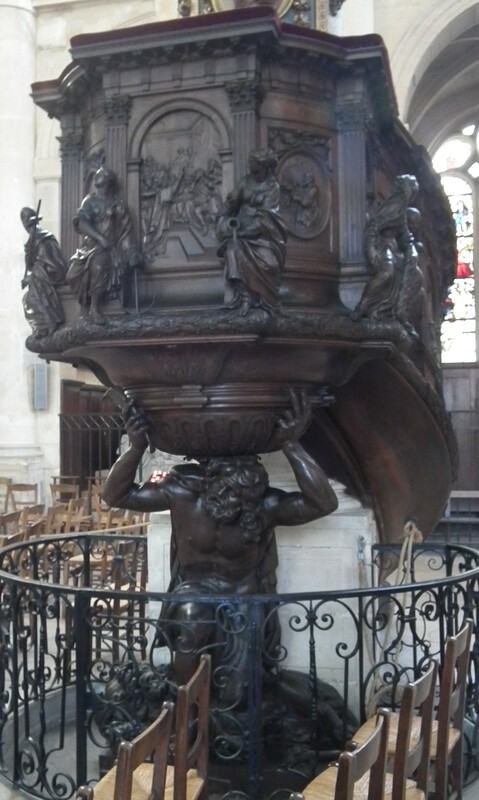 Sampson is holding up the pulpit and the carvings of the seven women that surround the pulpit symbolize the virtues: Prudence, Justice, Faith, Hope, Temperance, Fortitude,and Charity. How humbling to walk into a church this old, yet so captivating – not only by the incredible architecture but also because I know I can’t begin to imagine all of the history that took place inside these walls. 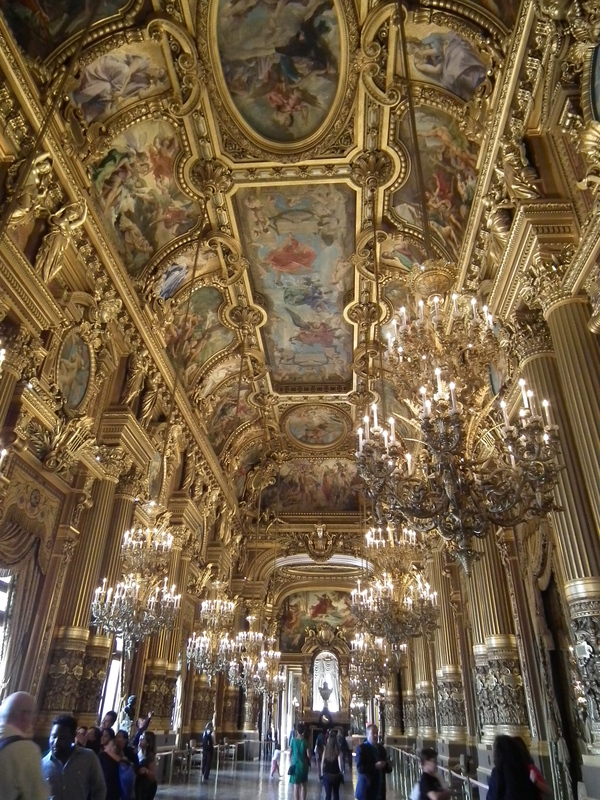 Then I light a candle for safe travels…..
Another sensory overload in Paris is the Palais Garnier ( Opera House in Paris). 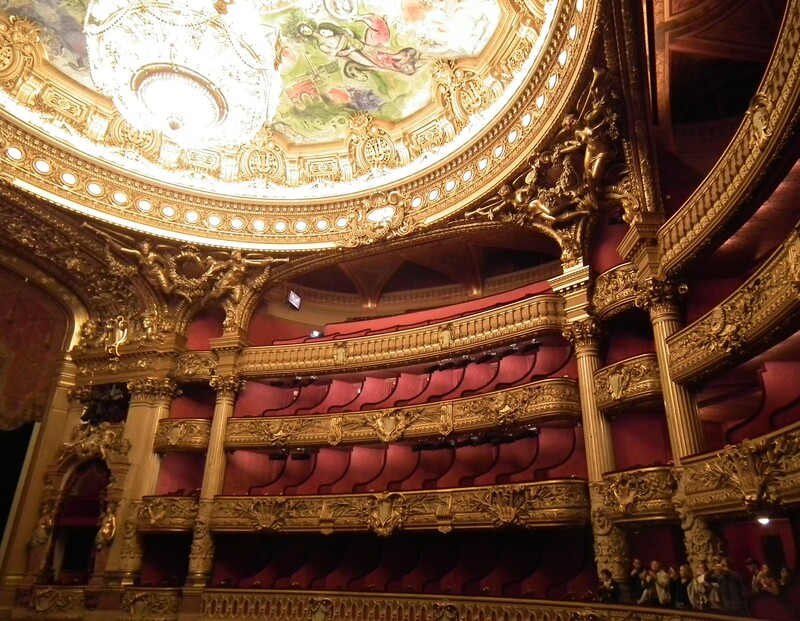 There are two Operas in Paris, the newest is a modern building and the original, The Opera Garnier, was built from 1861 – 1875 and it is BEAUTIFUL! 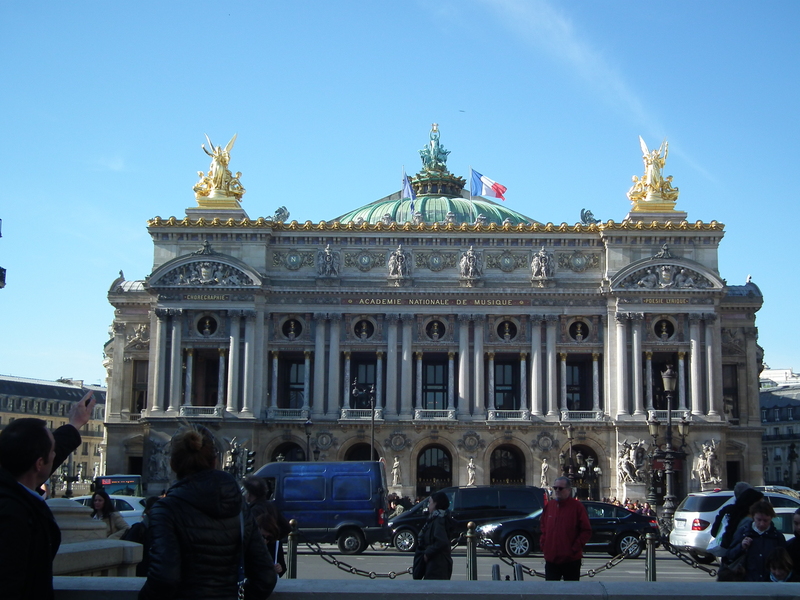 Other than it’s beauty, it is also famous for being the setting of the Phantom of the Opera book, written by Gaston Leroux in 1910. I, however, did not see any Phantom during my visit. 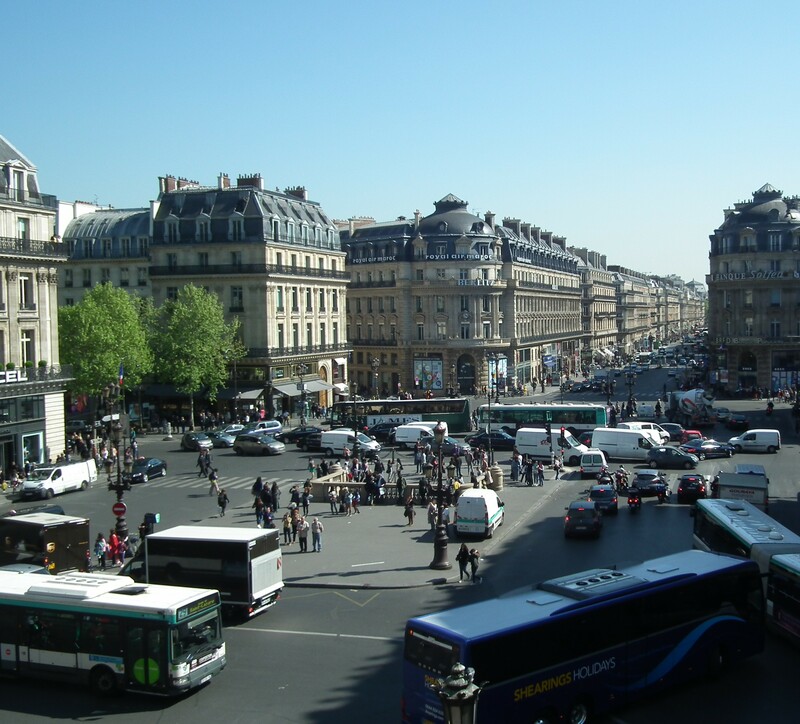 Typical of the streets and traffic of Paris. Not conducive to getting the best photos without risking life and limb. 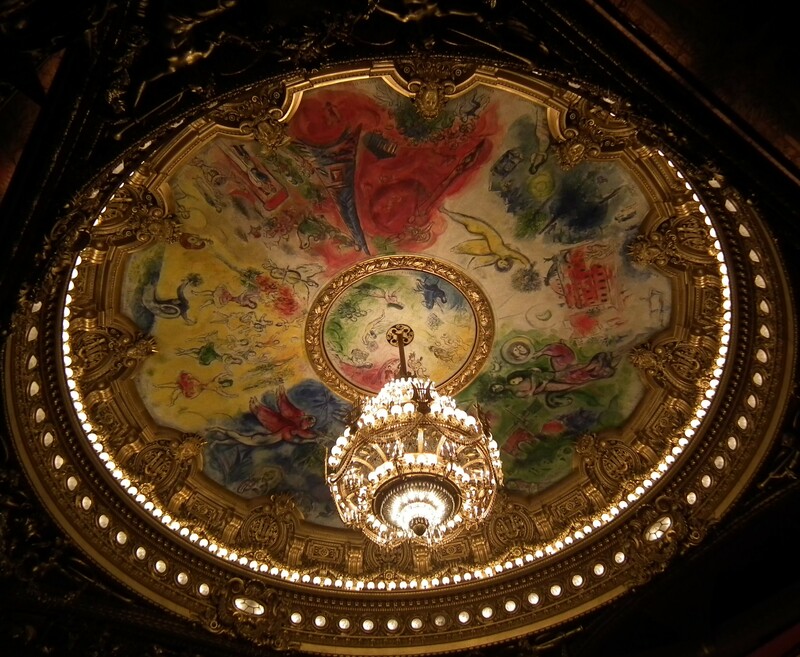 Painted ceiling of the Opera Auditorium by Marc Chagall with a 340 light chandelier that weighs 8 tons. Inside of Auditorium seats almost 2000. 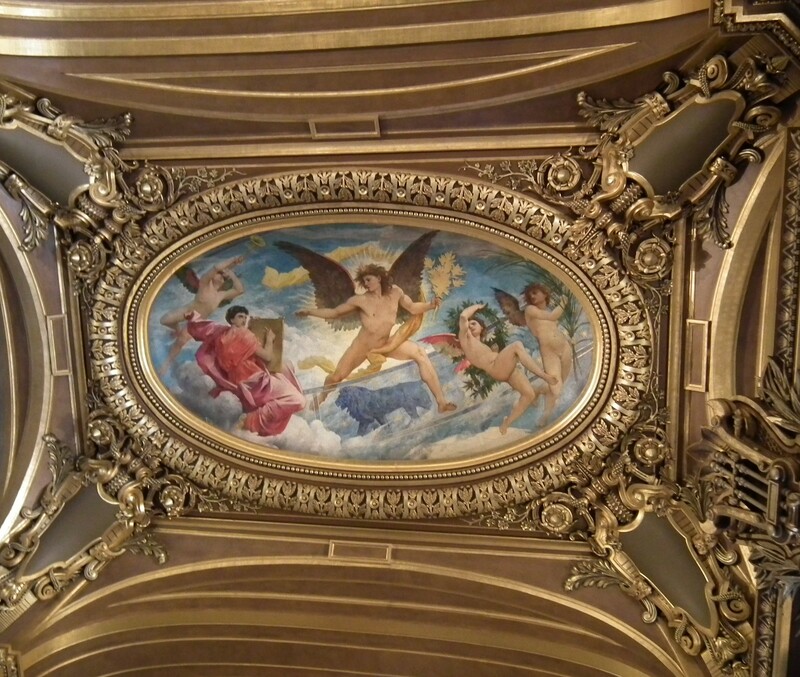 One of the paintings on the ceiling of Le Grand Foyer. 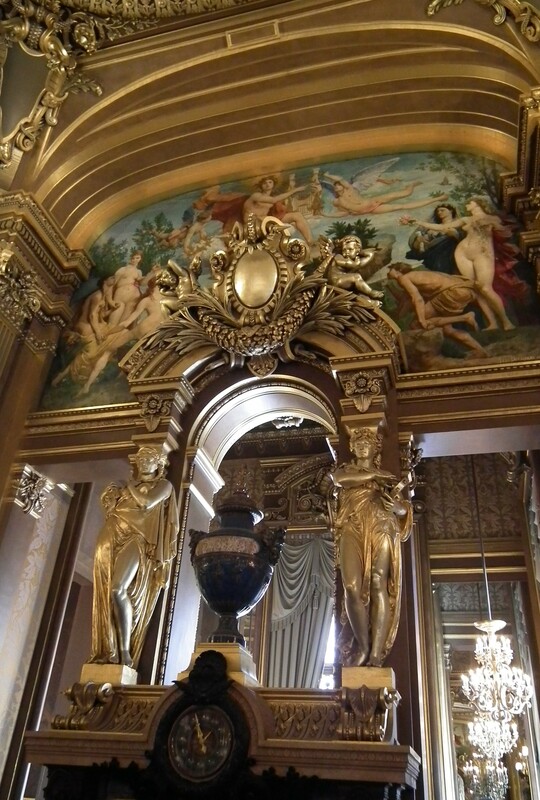 Doorway of the outside balcony off Le Grand Foyer (which looks out onto the previous photo of the busy streets of Paris). Close up of “Liberty ” Pegasus roof sculpture. 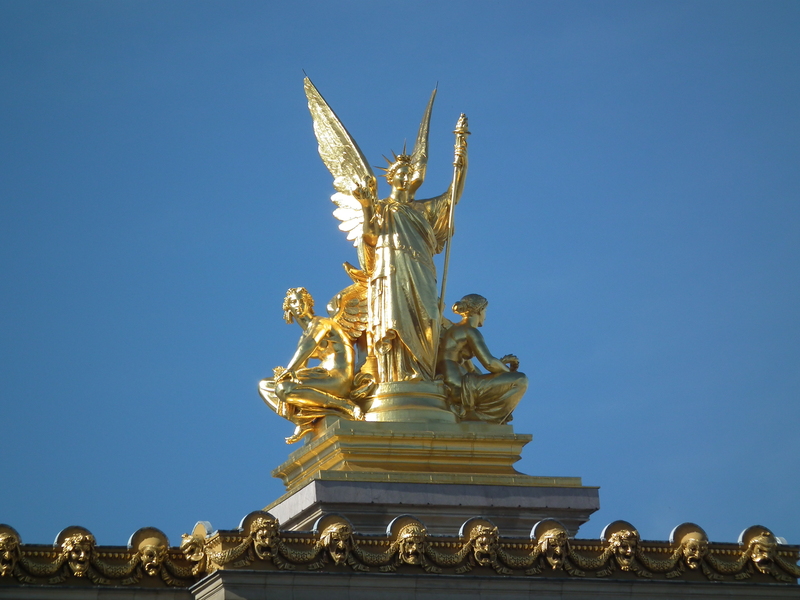 Close up of “Apollo, Poetry and Music” roof sculpture. 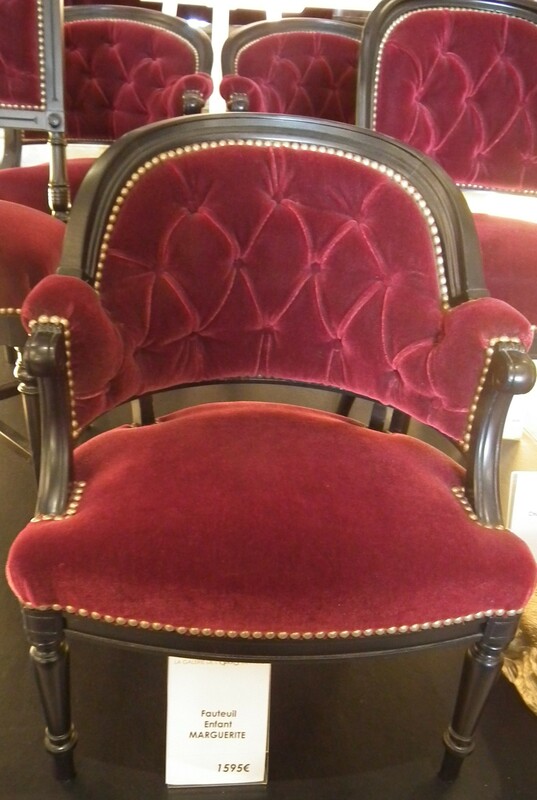 Before you leave, in the gift shop, you can buy your very own Opera chair souvenir for only 1595 Euro.